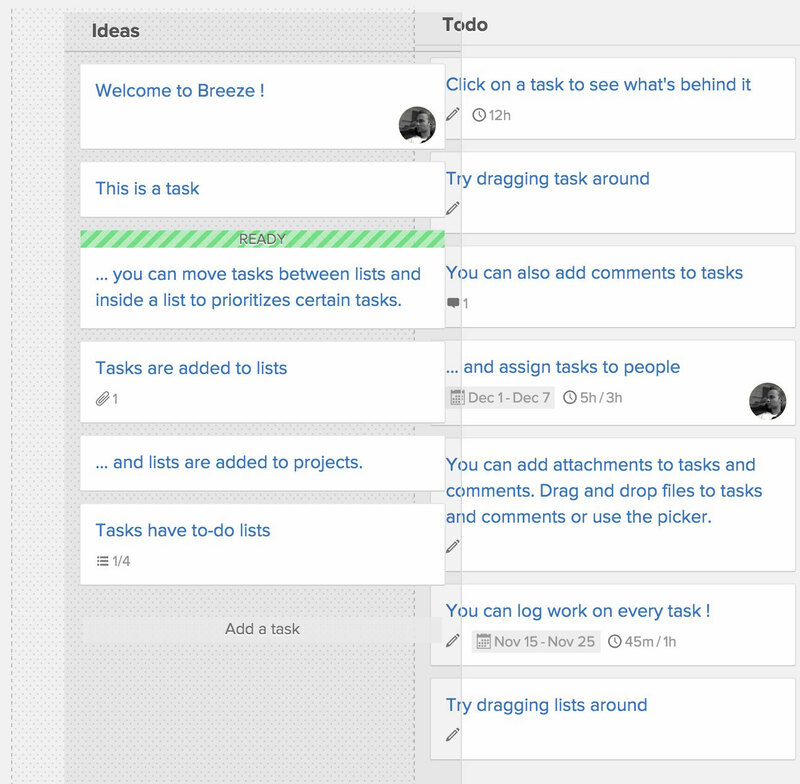 Simple Kanban Software for Everybody. 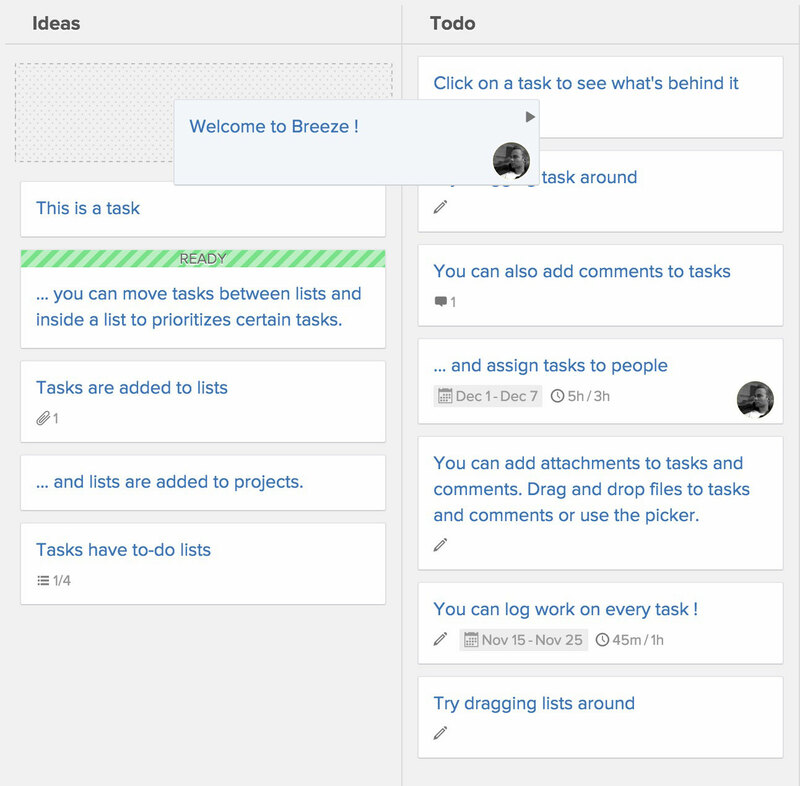 Breeze is a simple Kanban tool that has everything you need to help your team work together more effectively. Breeze is built from real world experience of managing hundreds of projects over the years. Kanban, Agile and Lean ideas are at the core of Breeze. It has all the tools for easy communication and feedback with your team. In the end, Breeze helps you set real goals and get things done. Stop starting, start finishing. Limit work in progress. What you call multitasking is really task-switching. Limiting the amount of work in progress (WIP) helps balance the flow-based approach so your team doesn't start and commit to too much work at once. The limits highlight team members that are overloaded or starved for work. Painless time tracking and billing. Breeze is meant for real world use. This means that you can track time, set budgets and estimates so that your clients can be happy and keep an eye on their budget. You can estimate each task individually and log your hours against it, either billable or not billable. You can also use your existing tools like Toggl and Harvest to track time. At the end of the month, you can take your hours from the projects and have them automatically billed. Track progress with analytics and reports. To improve your lead and cycle time you need to know whats happening in your projects. Breeze has all the reports you need - tasks, tasks due, time tracking, project totals and task completion. You can instantly see the tasks that are taking too long to complete. 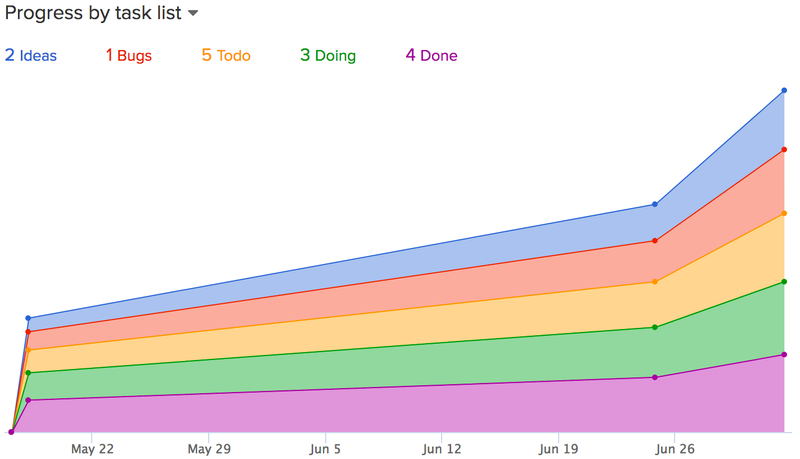 Use the cumulative flow diagrams to forecast projects and plan resources. Bubbles and gaps in the CFD charts show you the project shortages and bottlenecks. File storage with cloud support. All the extras and integrations you need. Instead of cluttering Breeze with features you'll never use, we offer optional free add-ons. Whether you need source code version management, accounting, real time chat or something else, we got you covered. Breeze has integrations with Slack, Github, Bitbucket, GitLab, Zapier, Toggl, Freshbooks, Groove, Harvest, Zendesk and more. You can even make your custom integration using our API. 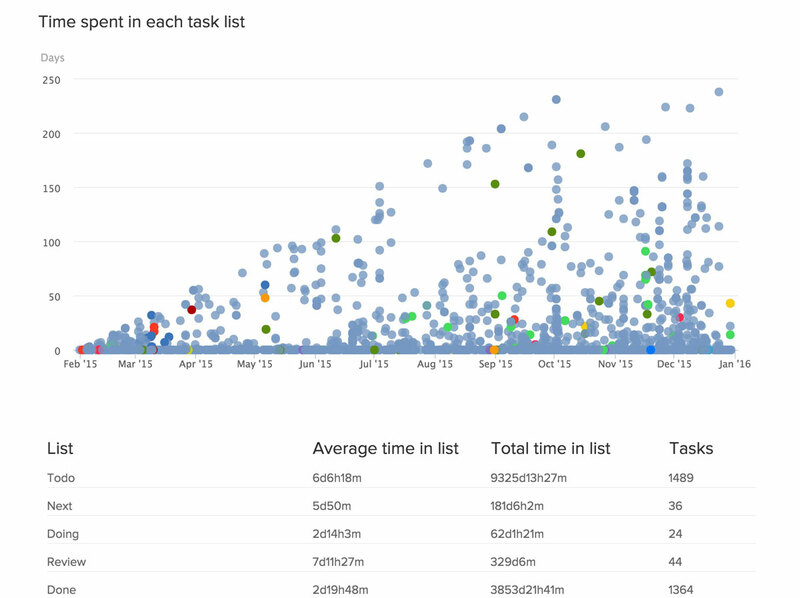 Join thousands of users who track their projects with Breeze. Breeze is used by freelancers, small to medium sized companies and large multinationals from every walk of life. 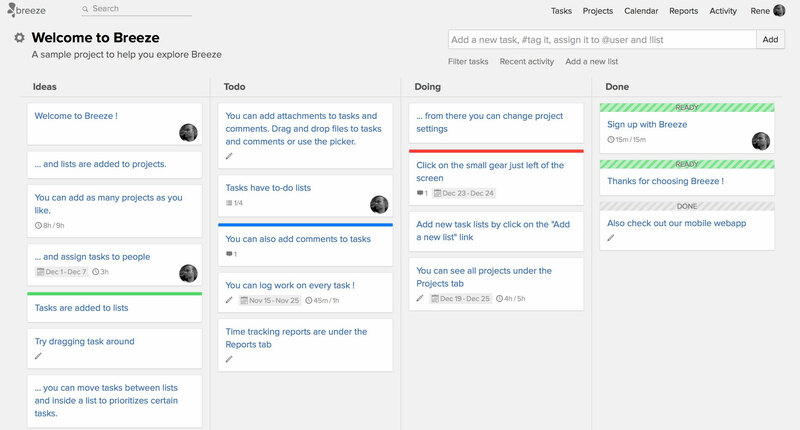 It's simple enough for your entire team - developers, marketers, project managers, accountants and designers can use Breeze for Kanban.